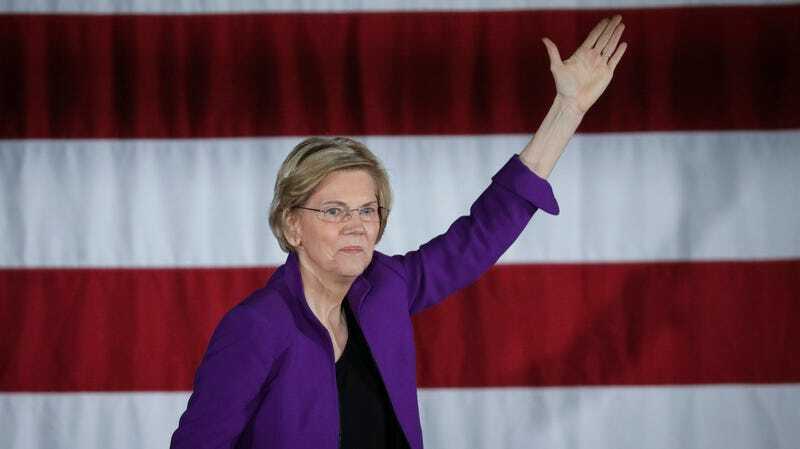 On Monday night, Democratic presidential candidate Elizabeth Warren called for a complete overhaul of America’s voting system and an end to the Electoral College. Yes, please. “Every vote matters, and the way we can make that happen is that we can have national voting, and that means get rid of the Electoral College,” she said at a CNN town hall at Jackson State University, a historically black college. Mississippi, as I’m sure many of the people in attendance already knew, was the first state to enact voter suppression laws targeting black people in 1890. After two elections in the last 20 years in which the popular vote winner lost the presidency, progressives have been arguing for Electoral College reform and an expansion of voting rights. In the run up to the 2020 election, their calls are getting louder. In February, former Attorney General Eric Holder called the Electoral College “undemocratic” and said it’s time to get rid of it. Former Georgia gubernatorial candidate Stacey Abrams is also battling Georgia’s voting system after losing to Brian Kemp, the same man who oversaw the election and who designed a voter registration process that targets minority voters. There is a parallel movement picking up traction across the country called the National Popular Vote Interstate Compact, an agreement between states to circumvent the electoral college and elect presidents based on who wins the national popular vote. So far, 11 states and Washington, DC have signed on, including swing state Colorado. But the agreement needs 270 electoral votes to be enacted. Currently, the agreement only has 181 votes. There is no valid defense for the Electoral College, an undemocratic system that dates back to a deal made with slave-holding states in the 1700s, in which presidents are elected by a small group of representatives instead of the actual votes they received. The electoral college was established in 1787 as a compromise between the framers of the Constitution. Though enslaved people were considered property and had no ability to vote, the framers decided to count each enslaved person as three-fifths of a white person in order to increase the representation of Southern states, which had considerably smaller white populations, and therefore had less voting power than Northern states—unless enslaved people were counted. Each state then earned a number of representatives based on the population, inflated by the racist agreement proposed by James Madison and these representatives made up the Electoral College. This system has stayed in place even after slavery was abolished, and even when black people and women won the right to vote. Today, the system incentivizes presidential candidates to focus their campaigns on a handful of swing states, rather than appeal to a broader base of voters across the country, and it nulls the voting power of minorities in deeply red states: Seventy percent of black people vote for Democratic candidates, and according to the 2010 census, 55 percent of the black population lives in the South. Progressives like Warren have taken up numerous ambitious causes, forcing their party to the left on issues like climate change, paid family leave, abortion, and child care. Warren is right to prioritize voting rights and abolishing the Electoral College, and more Democratic candidates should join her. Just get rid of the thing already.